Tuesday I was baby sitting my nephew Mac while Mum Lucie had a hair cut, I took my entertainment with me, Betty! 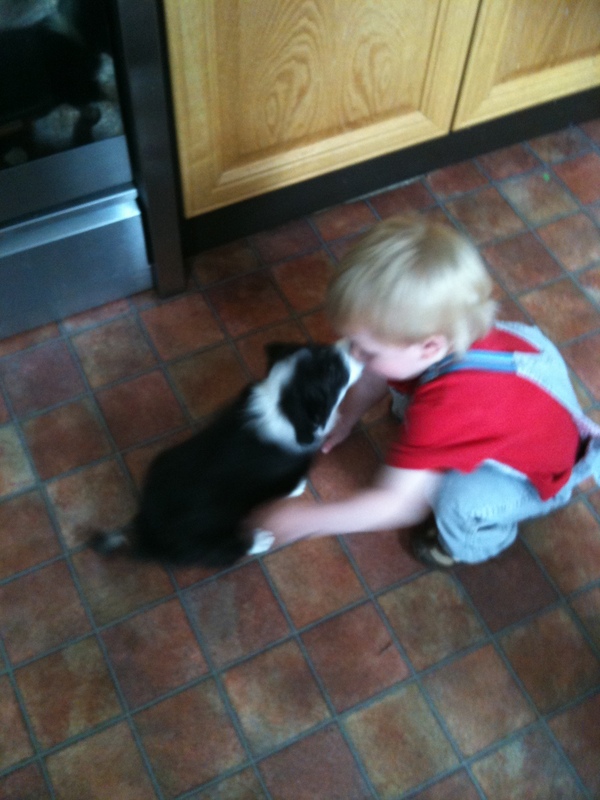 Mac is used to living with a dog and loves animals, he was fascinated by Betty as she was with him! They got on great, Mac is a perfect child to introduce a puppy to as he is relaxed with dogs, not at all phased by her rushing around and jumping about! Mac was so gentle with her, a great start to her experiences with small children. By introducing Betty and continuing to expose her to children from this young age, she will grow up enjoying children! I have to confess, that evening I had a really painful neck, no idea how I did that, but it is at times like that it is hard work having a small puppy, all I wanted to do was lay on the sofa and watch TV and sulk about my neck! Betty had to make do with less than usual attention from me! Pie was grateful for some down time on the sofa with me:) Thankfully today I have been to a great therapist, Beth, and I am much better!